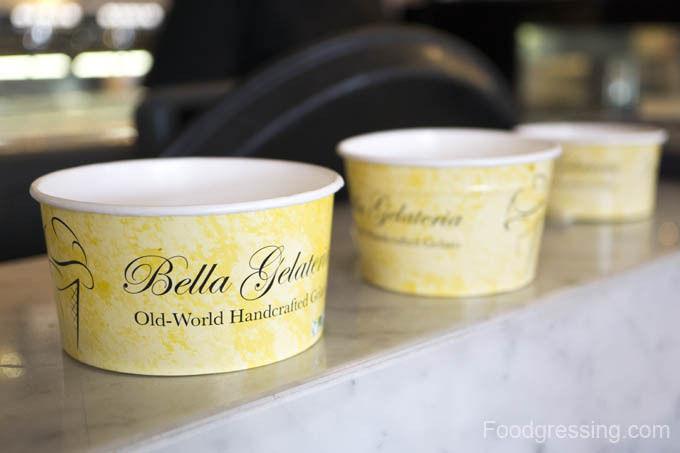 Bella Gelateria is world-renowned for their gelato; it’s a place everyone should try when in Vancouver. During cruise ship season particularly, lines of tourists can be seen in front of the Coal Harbour location. In this post, I will share with you my experience with their gelato and with their flavours for this year’s Hot Chocolate Festival. 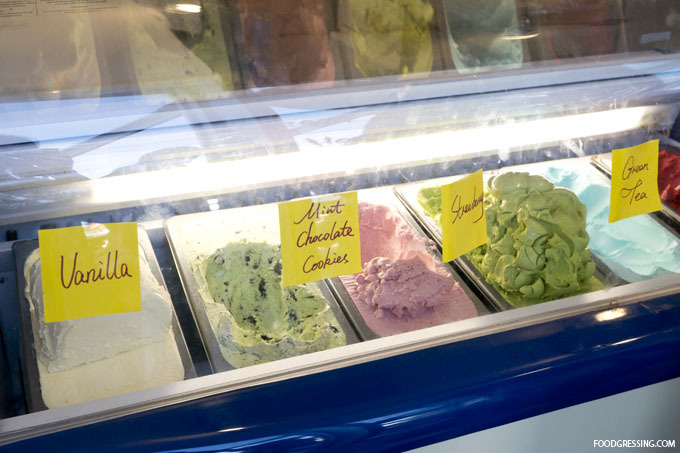 Having been to Bella Gelateria’s Yaletown location, I am familiar with their delicious cold treats. 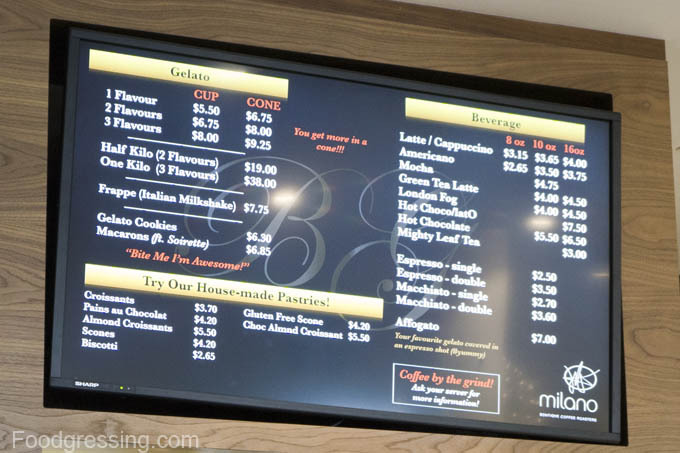 The pricing for the gelato at Bella Gelateria Coal Harbour is the same. 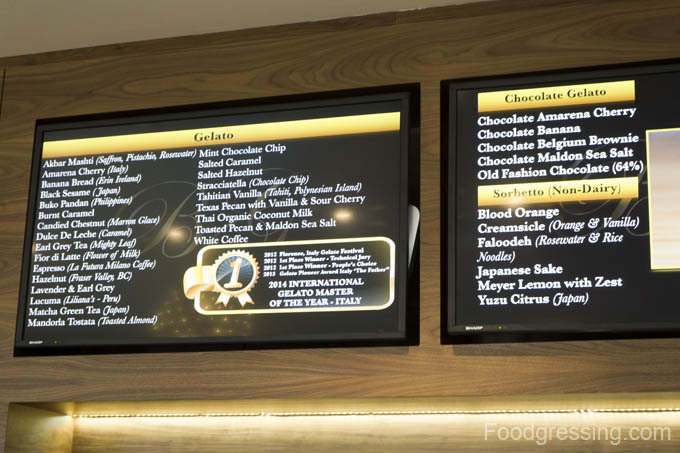 Dessert-goers can treat themselves to one ($5.50), two ($6.75), and three ($8.00) flavour cups. Cones are an extra $1.25. 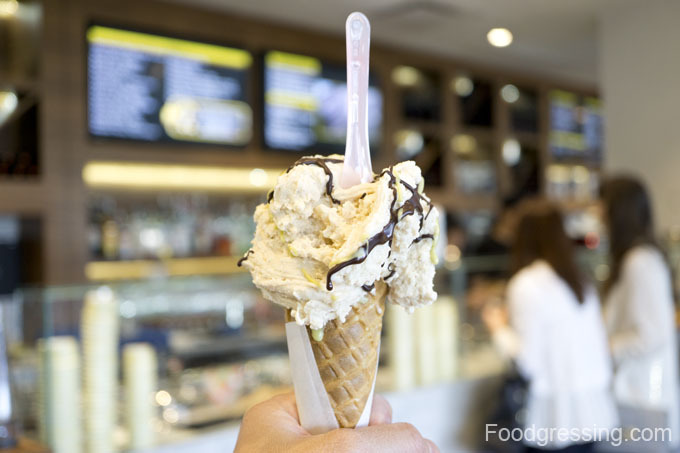 I tried the salted caramel gelato and blood orange sorbeto at the Yaletown store last summer. 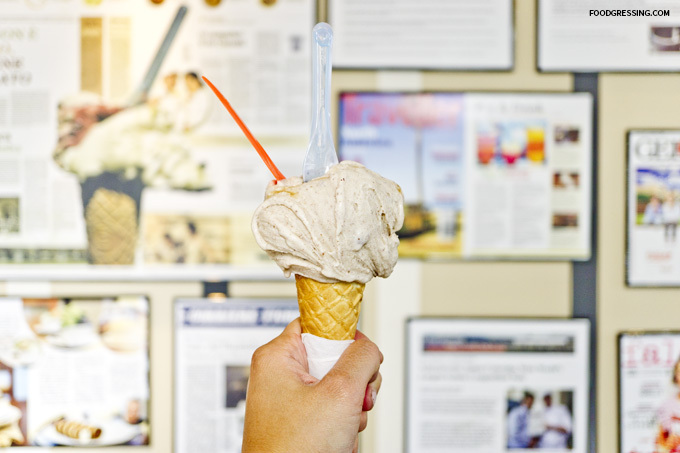 Recently, I took my son there and we shared the toasted pecan and maldon sea salt. It was heavenly. I loved that it was creamy and light with a mix of sweet and salty. My son very much enjoyed the flavour and both of us finished the cone in no time. Today, I visited Bella Gelateria with a friend to try out their hot chocolate flavours as part of the 6th annual Vancouver Hot Chocolate Festial. We tried #07 – “The Mottolino” and #08 – “Black Magic.” Each hot chocolate was $7.50 and came with a small treat (sorry, no gelato). “The Mottolino” had Michel Cluziel’s Kayambe Dark 72% chocolate as well as alcohol in it. You could definitely taste the brandy and rum. 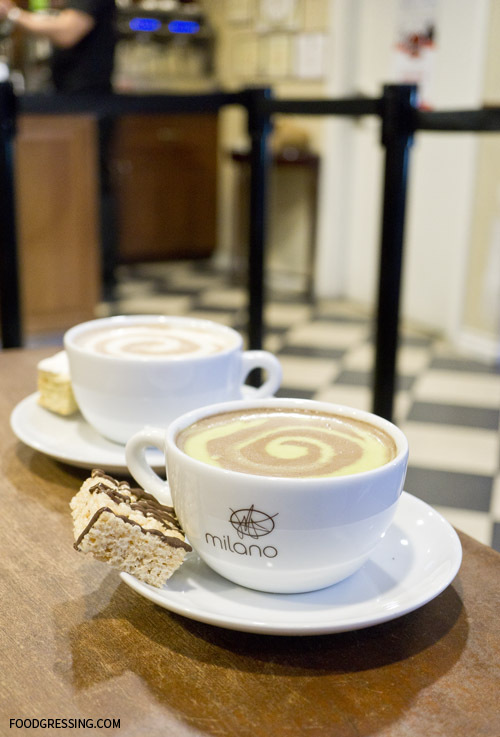 It also had vanilla egg and hints of espresso from local roasters Milano. I enjoyed the fresh whip cream topping in a swirl with a sprinkle of cocoa powder. 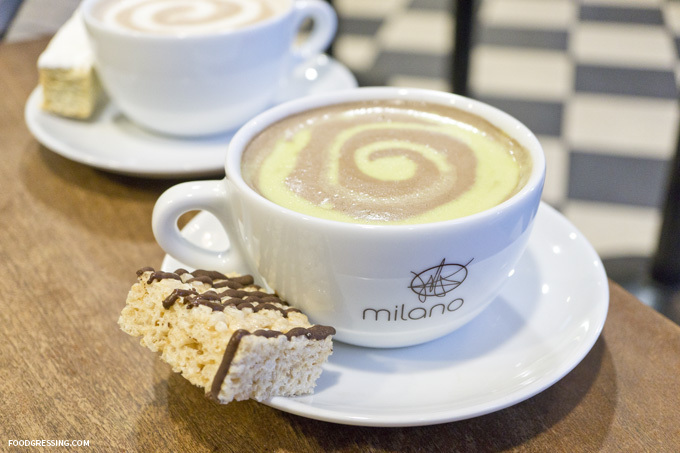 Overall, if you enjoy alcohol in your hot chocolate, then the Mottolino is for you. 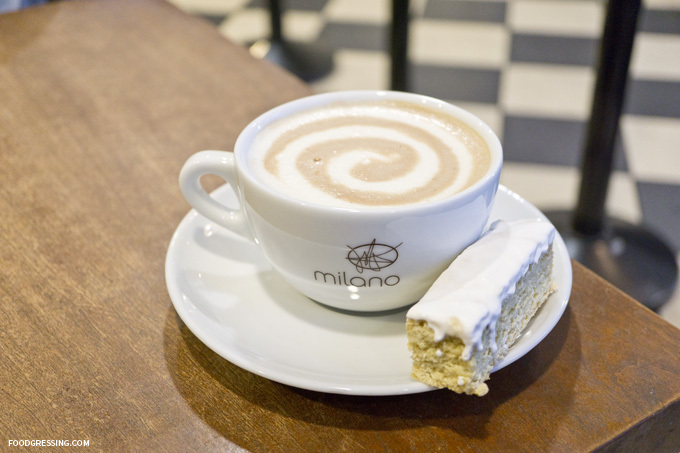 The Mottolino was also served with a house-made Italian dark rum biscotti. This biscotti tasted stale and wasn’t very hard. A miss for me. The second hot chocolate we tried was the bBlack Magic which had a mix of black seasame and matcha flavours. The drink had organic black sesame seeds turned into paste and then added to Michel Cluizel’s Vanuari Dark 63% Vanuari chocolate with it’s honey, berry and vanilla notes. The swirl topping was a fresh matcha whip cream with a sprinkle of roasted black sesame seeds. I enjoyed the Black Magic to the Mottolino which had a lovely fushion of black sesame and matcha. The flavour was intense but delicious. It was supposed to be paired with a house-made Italian Black Sesame biscotti sprinkled with organic matcha powder but it was not available. We chose the rice crispy bar drizzled with peppermint chocolate as a substitute. It was not very special at all. Disappointing on that front. On Canada Day, my family and I decided headed down to Canada Place like so many others to partake in the local celebrations. Since it was hot that day, I was very in the mood for some ice cream. We went to Bella Gelateria, known as having the one of the best gelato’s in the world, located on West Cordova and Burrard. There was a line up *obviously* but we decided to turn away when the line appeared to move too slowly for our liking. I was a bit disappointed (no gelato makes me sad) but then we stumbled upon QQ Gelato, a small gelateria on the east side of Vancouver Convention Centre. QQ Gelato is a small shop: after you enter the door, you pretty much arrive right at the ordering counter. 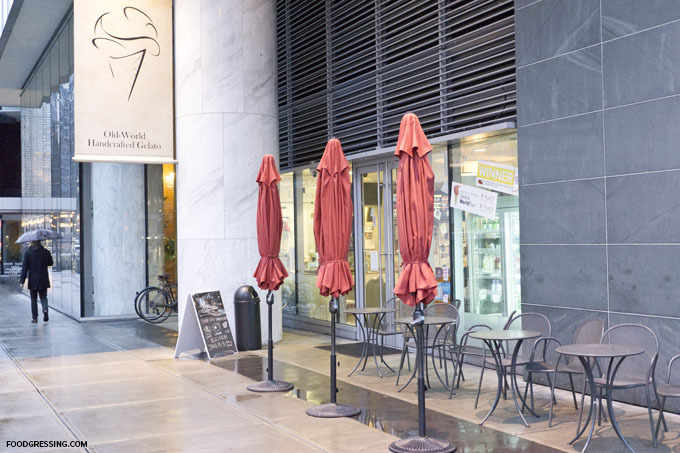 There is no seating inside QQ Gelato, but there are lots of outdoor sitting areas around the convention centre. QQ Gelato is also the sister store of QQ Bubble Tea and Coffee in Richmond. 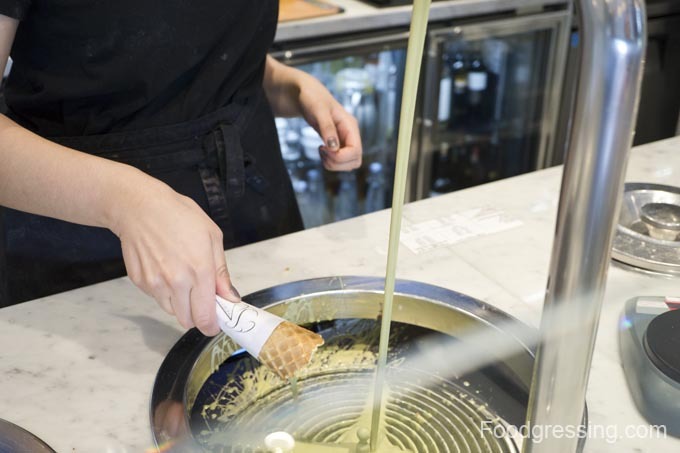 QQ Gelato has 12 different flavours of gelato available at once including green tea, black sesame, espresso flake and pistachio. 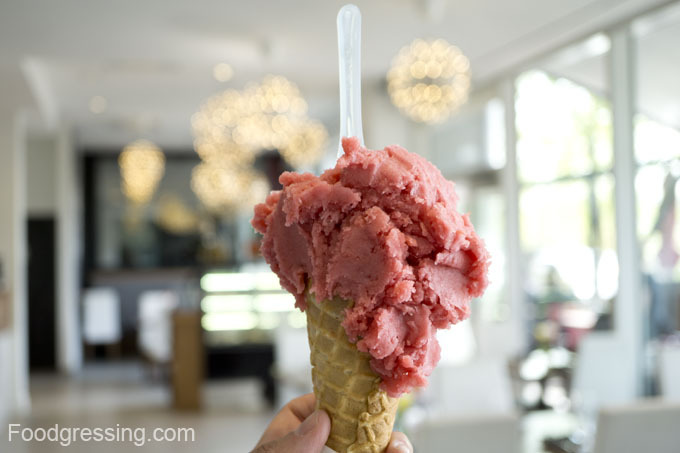 There are two sorbetto (lactose-free) flavours : raspberry and lemon. A single cup or regular cone costs $4.25 and a double costs $7.50. 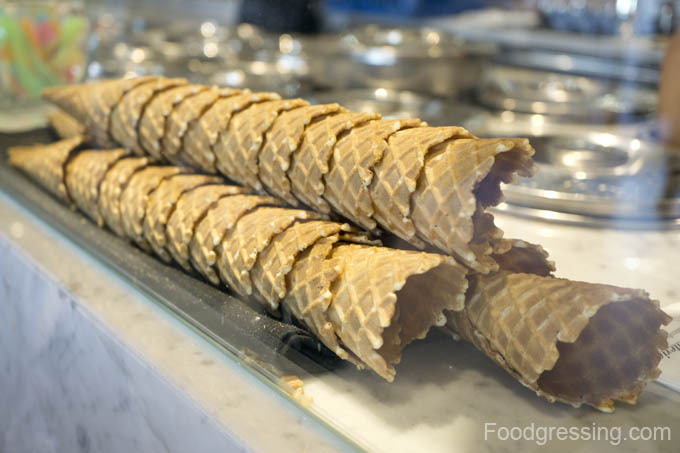 A waffle cone costs an extra $0.50 for the single serving and $1.00 for the double serving. 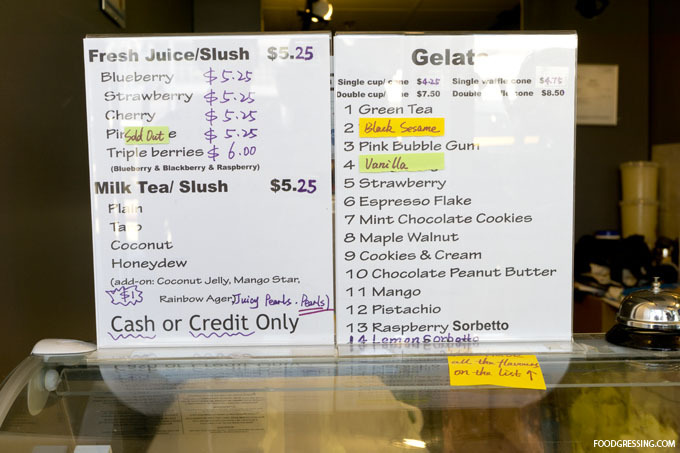 QQ Gelato also has fresh juice slush and milk tea slush ($5.25 – $6.00) with optional add-ons. Although there are a limited number of flavours in the display case, they do have *all* the flavours that are on the list. They take cash or credit only. On Canada Day, I tried the raspberry sorbetto in a waffle cone ($4.75) which had a nice and intense raspberry flavour. 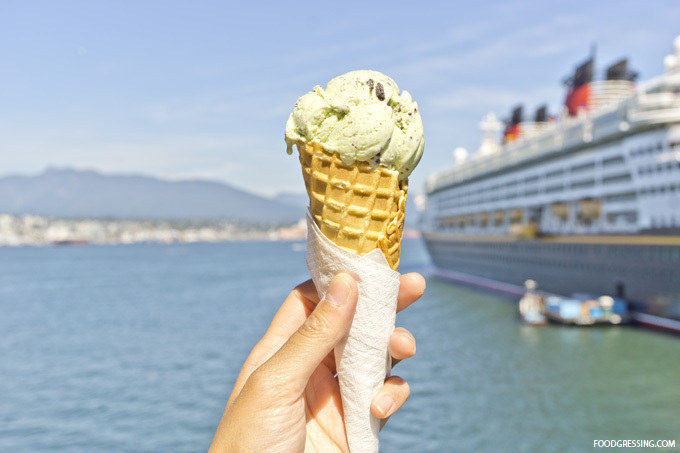 I returned yesterday on BC Day and had the mint chocolate cookies in a waffle cone ($4.75). This gelato flavour was surprisingly good: the mint taste was not too overpowering while the chocolate cookies added a fun crunchy texture. The waffle cone was perfectly crispy with a delicious sweet flavour. It was also fun to see a Disney cruise ship docked and it even played “It’s A Small World” with the ship horns. 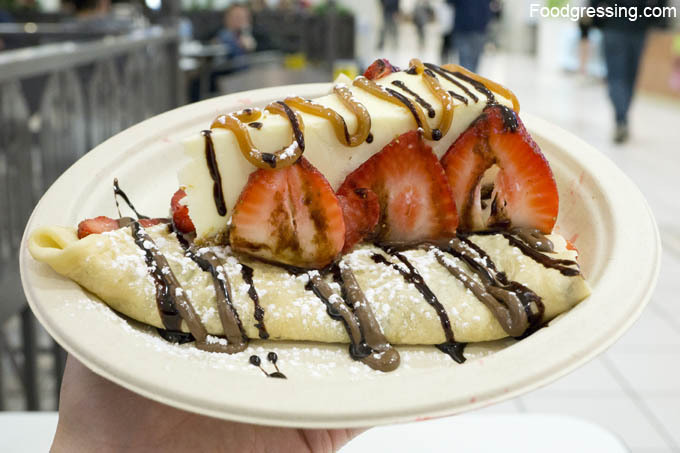 Crepe Delicious is Canada’s largest mall-based creperie. 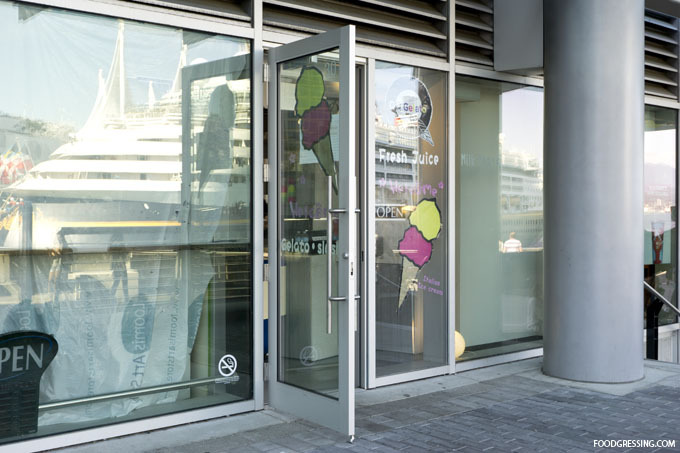 Their Oakridge Centre location opened a few months ago and occupies the old Mmmuffins space. I bought the Groupon voucher for this new location to try them out. 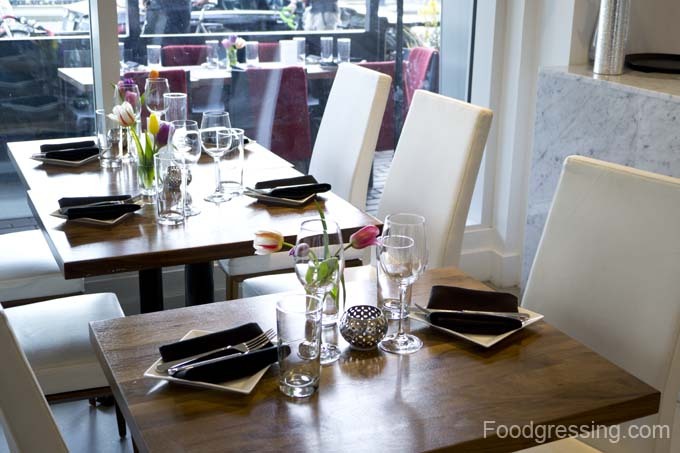 The deal was $18 for three $10 vouchers and could be used towards any of their menu items. 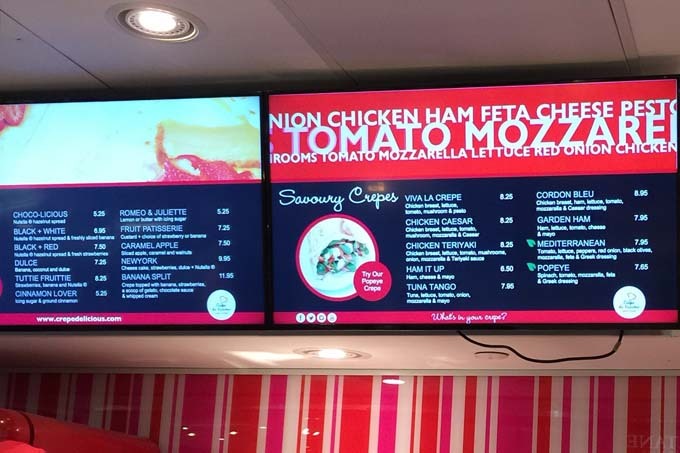 Their menu consists of breakfast crepes, savoury crepes, sweet crepes, salads, panini, gelato, smoothies, and coffee. 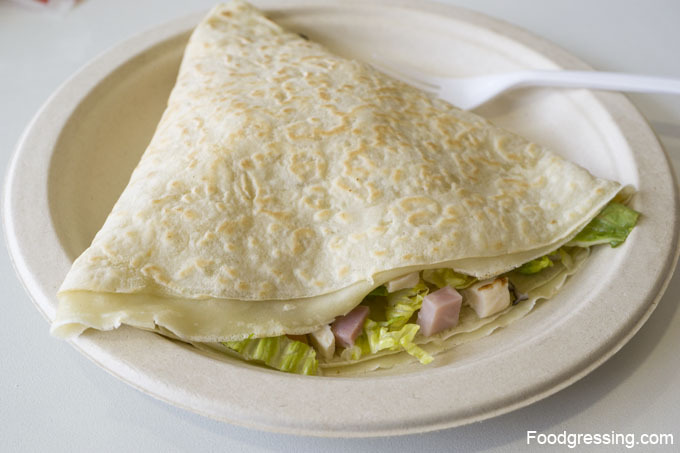 The sweet crepes range from $5 to $12, while the savoury are mostly around $8. The Cordon Bleu ($8.95) I tried had chicken breast, diced ham, lettuce, tomato and mozzarella, and caesar dressing. I was a little disappointed that the crepe fillings were cold and the cheese was not melted. The crepe was also barely warm and the presentation was a bit boring. The Banana Split is their most expensive sweet crepe ($11.95). 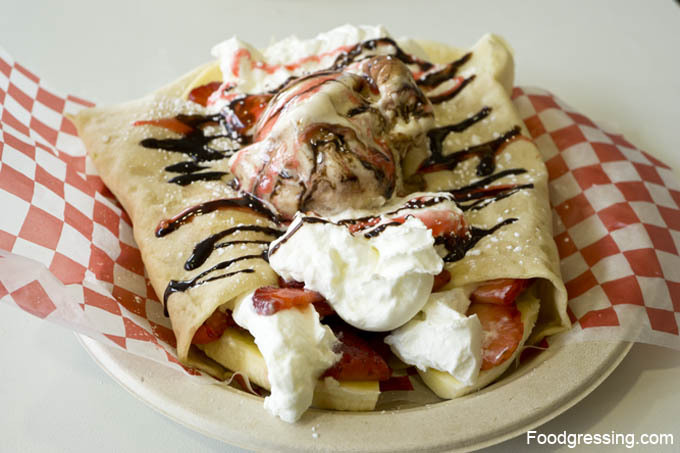 It consists of crepe topped with banana, strawberries, a scoop of gelato, chocolate sauce, and whipped cream. I enjoyed the presentation much more than the Cordon Bleu. The gelato I had was tiramisu and was okay. The amount of bananas and strawberries used for the filling was decent. The New York ($9.95) was quite the indulgence. It had Nutella, a slice of cheesecake, and strawberries topped with dulce de leche. I had several looks from other people at my plate while I carried it to a table at the food court. I was impressed that the slice of cheesecake was reasonably sized. The cheesecake seemed standard in taste and quality. I noticed that for all three items I tried the crepes seem to be on the thicker side, rather crisp, light and airy. The crepes ideally should be warm but they seemed a bit cold, particularly the Cordon Bleu. I have mixed feelings about Crepe Delicious. The sweet crepes seemed better in terms of taste, amount of ingredients and overall presentation. I think the crepe texture could be improved. 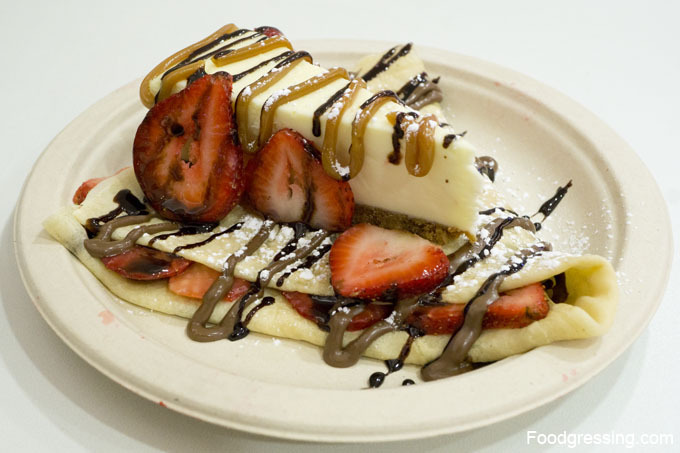 For a mall-based creperie, Crepe Delicious may be okay. However, it would not be my go-to creperie.